The English Civil War period has always been a rich source for horror. James I whipped everyone up with his book Daemonologie in 1597 and his subsequent promotion of, and attendance at, witch trials. Keith Thomas’s classic study Religion and the Decline of Magic argued that in the 16th and 17th centuries the shift to Protestantism left ordinary people bereft of the panoply of saints and rituals who protected them on a daily basis, and so magic, astrology and the craft of cunning men and women arose to fill the gap. By the time English Civil War came along the break down in society, the established church and the sudden explosion of religious and mystic sects made for rich pickings among those who, both at the time and later, wanted to portray the era as one riddled with devilry and chaos. In the cinema, Michael Reeves’s 1968 movie Witchfinder General, starring Vincent Price, kicked the genre off, leading to such understated classics as Blood on Satan’s Claw (1970) where 17th century peasants dig up a satanic monster in a field. The great Puritan horror fantasy character was, of course, Robert E. Howard’s Solomon Kane (though for some bizarre reason he seemed to spend most of his time in Africa being a bit racist). He finally rolled up in Michael Bassett’s 2009 film of the same name. Despite the inevitable CGI monster battle at the end, James Purefoy did a great job as the tormented Kane trying to escape from his evil past as a pirate, supported by Peter Postlethwaite as a slightly anachronistic Quaker, and Max von Sydow doing his stone-faced dad impersonation. O’Neill. Possibly the devil, possibly a sorcerer, possibly someone’s hallucination. 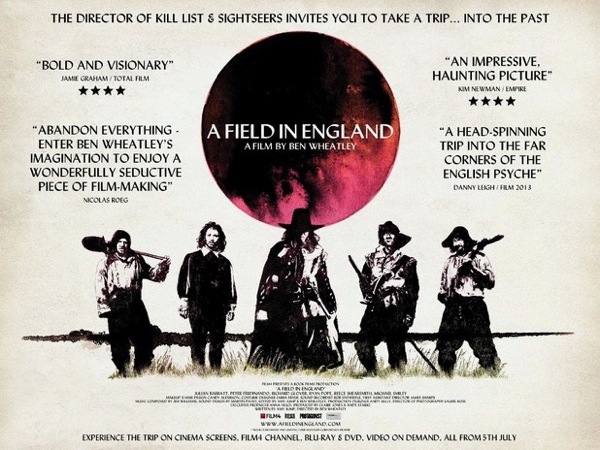 Which leads us on to Ben Wheatley’s A Field in England, simultaneously released on TV, in the Cinema and on iTunes this week. On the surface it has all the trappings of a low-budget period horror film. 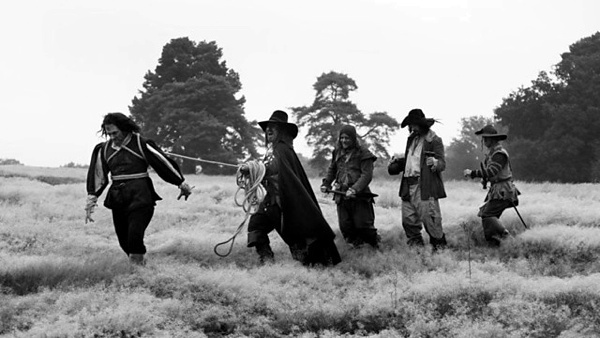 Three men escape from a battle – a fussy clerk (played by Reece Shearsmith of The League of Gentlemen fame), a deserter (Julian Barratt from The Mighty Boosh) and a dimwit (Richard Glover). They fall in with another soldier who leads them to a field, fills them up with magic mushrooms and gets them to pull on a big rope until a mysterious figure called O’Neill appears at the other end, presumably yanked out of some eldritch dimension. Like the sinister Gil-Martin in The Private Memoirs and Confessions of a Justified Sinner you never know whether he’s a mighty sorcerer, the devil, or the figment of someone’s imagination. He forces the other men to dig for some unspecified treasure, which he locates by subjecting Reece Shearsmith to ritual abuse in his tent. The film gets increasingly bizarre, culminating in what can only be described as a 17th century acid trip. People die and pop back to life, some kind of magic battle occurs involving mighty winds conjured out of nowhere and a giant black ‘malignant planet’ appears in the sky. The film has great potential, and the beautiful black and white photography transforms an ordinary sunny field in a sinister world of impending terror. Close-ups abound, both of lined, anguished faces coated in filth, and chaotic blades of grass threaded with bugs. It’s quite a remarkable feat to make a dandelion clock look totally evil yet A Field in England manages to do just that. The way the camera transforms the mundane into the deeply disturbing – via tracking shots through long grass, out of focus figures against over-exposed landscapes and disorienting lapses into slow motion and split screen – is very reminiscent of David Lynch’s odder moments. The performances are uniformly excellent, especially from the two comedians who act out their role as trapped souls with great conviction. Michael Smiley as O’Neill (possibly the devil) is completely sinister. The entire movie is set up to be a wonderfully scary low-budget horror movie with M. R. James overtones in which an evil from beyond time and space erupts into a summer pasture in old England. Looking for treasure, Seventh Seal style. But it never happens, and sadly, that’s where the film falls down under the weight of its own avant-garde cleverness. 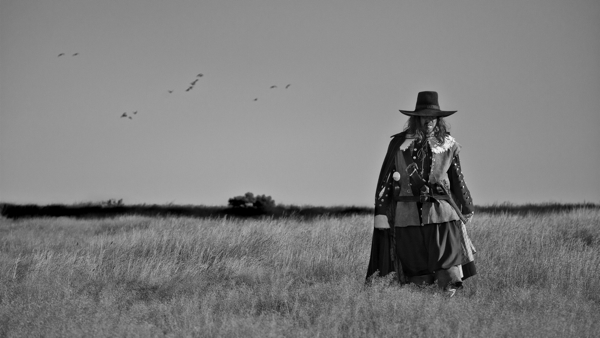 Having lined up a great cast, setting and imagery, Ben Wheatley wastes it on a deliberately enigmatic and confusing series of episodes, whereby mystery and illusion are piled on each other without any real sense of purpose. Ok everyone’s been eating magic mushrooms, which either allow them to tap into eldritch powers or simply cause them (and the audience) to have a series of hallucinations, but in the end that’s all there seems to be – a bunch of generally incoherent weird stuff mixed in with some olde-worlde brutality. 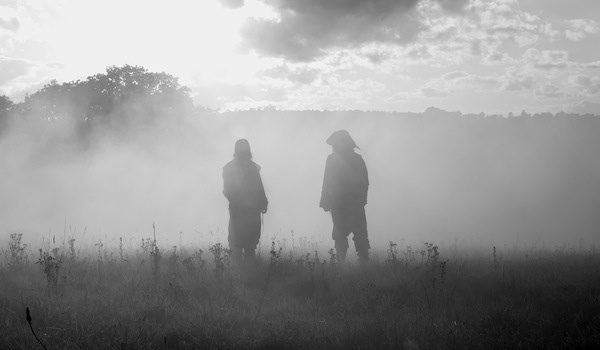 As the end credits roll you don’t really have much idea of what it is you’ve actually sat through – is it some kind of take on The Pardoner’s Tale – greedy and stupid men finding Death in a field? Is it a tale about arcane magic, or an acid trip, or a hallucinatory essay on friendship based around five ‘everymen’? There’s a nagging sense that there’s another, far more interesting film, just hovering around the corner, which we never see, but which could be a really intelligent and ground breaking horror movie. Having said that it’s a fascinating watch, with some great imagery and wonderful performances. Unlike a lot of people who’ve come to the end with a slightly bored feeling of WTF? I do plan on sitting through it again, though I think it will merely serve to fuel my frustration at the lost opportunity to do a really powerful M. R. James-style English historical horror movie. It’s beyond weird, but also incredibly frustrating because it has such potential, and it’s wasted. I think I’ll be watching it a few times though. I think I’ll wait for the DVD….it might cost more than buying a cinema ticket, but it could have the deleted scenes, alternative endings, director’s commentary and all the other folderol which will extend (and explain?) what was in the final cut.